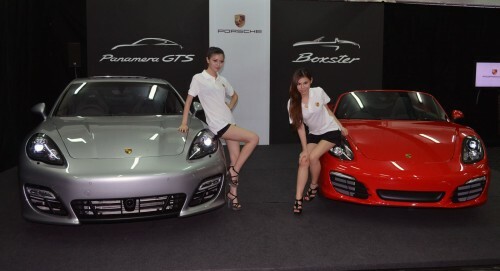 The new Porsche Boxster and Panamera GTS made their local debut yesterday afternoon at the Sepang International Circuit, where official distributor Sime Darby Auto Performance (SDAP) is having the Porsche Motorsport Week 2012. The event, held to reward SDAP customers, combines two activities – Porsche Driving Experience (skid pad, moose test, brake test, slalom in various models) and Porsche Circuit Training. 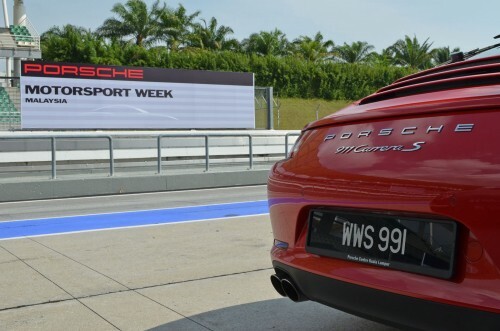 The latter gives participants a chance to push cars like the latest 911 and Cayman R on the full Sepang track. Porsche Motorsport Week started yesterday and will run till Saturday. “Motorsport is the heart of Porsche and this is precisely why we introduce more and more driving activities on the track. We want our customers to experience the brand and the car, and to understand how to maximize the performance of the car as well as safe driving,” explained Arnt Bayer, CEO of SDAP. On to the cars. Announced earlier this year, the 981 Boxster comes with an all-new lightweight body design and a revamped chassis, not to mention sleeker, more dynamic looks. The new cabin is a huge improvement as well. The red example at the launch really got me drooling! The lady in red is a fit one. At 1,310 kg (1,320 kg for the Boxster S), the two-seater roadster is lighter than its predecessor and also three of its German rivals. This is despite better performance and a larger footprint – the 981 has a longer wheelbase, wider tracks and larger wheels. The fully electric roof is new, too. It does its thing in nine seconds, and can be operated at speeds of up to 50 km/h. 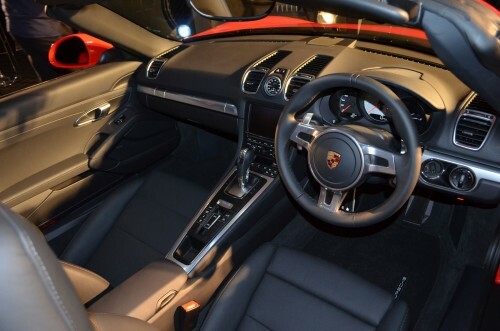 The base Boxster is powered by a 2.7-litre flat-six with 265 hp and 280 Nm of torque from 4,500 to 6,500 rpm. This engine is downsized by 187 cc, but packs in 10 hp more, and is also 15% less thirsty. 0-100 km/h is done in 5.5 seconds on to a 262 km/h top speed. 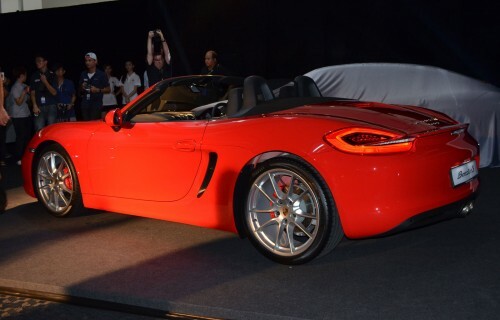 Meanwhile, the Boxster S is motivated by a 3.4-litre flat-six with 315 hp and 360 Nm of torque from 4,500 to 5,800 rpm. The S does the century sprint in 4.8 seconds, and has a 277 km/h top speed. Both boxers have direct injection, VarioCam Plus, auto start/stop, electrical system recuperation and enhanced thermal management. All times are with the optional (and desirable) Sport Chrono Package, which brings dynamic transmission mounts, a Sport Plus button and an analogue stopwatch into the picture, among other things. 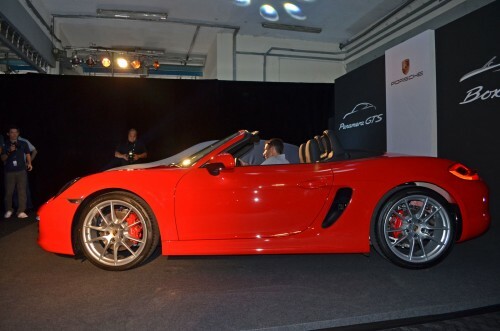 In Malaysia, the Boxster comes only with Porsche’s seven-speed PDK gearbox. Claimed fuel consumption is 7.7 litres per 100 km for the Boxster and 8.0 litres per 100 km for the Boxster S. Also new to this model is Porsche Torque Vectoring with a mechanical rear axle diff lock. The Panamera GTS is the other car in the spotlight. GTS stands for Gran Turismo Sport and this is the purist member of the Panamera range, according to Porsche. 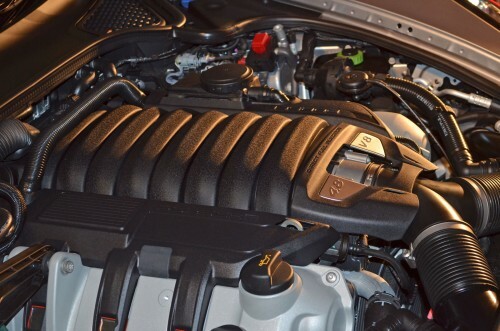 The naturally-aspirated 4.8 litre V8 engine from the standard car has been massaged to deliver 30 horses more at 430 hp. Max torque is also up by 20 Nm to 520 Nm. PDK and Sport Chrono are standard – both combine with the V8 to push this big car to 100 km/h in under 4.5 seconds. Top speed is 288 km/h. Redline has been increased by 400 rpm to 7,100 rpm. Along with the stronger engine, the Panamera GTS gets upgraded brakes (from the Panamera Turbo), a 10 mm lowered body, air suspension and Porsche Active Suspension Management. PASM is an electronic active damping control system with three modes – Comfort, Sport and Sport Plus. Looks wise, the GTS adopts many styling cues from the Turbo such as the bi-xenons with four LED DRLs, SportDesign front apron, 19-inch wheels, red brake calipers and rear spoiler. The latter rises upwards and outwards from 90 km/h. Lots of Alcantara and GTS logos in the cabin. The Malaysian spec GTS comes with 20-inch RS Spyder wheels, eight-way powered seats, four-zone air con, electric rear blinds and Porsche Communication Management including a HDD-based navi system. 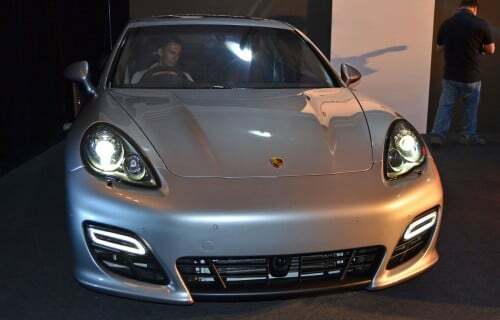 Prices start from RM450k for the Boxster and RM550k for the Boxster S. The Panamera GTS will set you back RM1,050,000. Prices do not include registration fee, road tax and insurance. Buy your Porsche from SDAP and you’ll get a four-year warranty and four-year complimentary service and maintainence package. Too bad its priced out of affordability. Time to spend more time at work then. Wow, so cheap ka??? 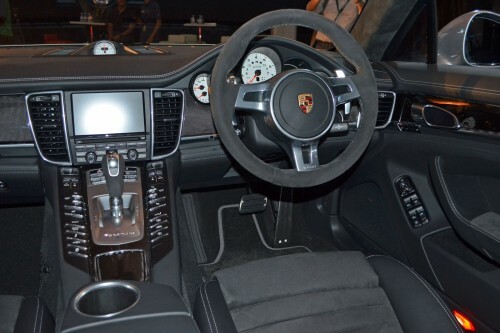 Hmmmm…..
Buy Porsche from SDAP and u will get 2 SEDAPs free…….one can fit the front boot…..
that picture of the girl inside the front boot space is hilarious! i too don get it why does the girl need to be inside the boot ? are they trying to prove that it is spacious? or you can sneak 1 mistress around without the ma’am knowing? hahaha..your statement made this story even hilarious! you made my day dude! So, on a rear-engined car, bonnet is called front boot. what happened to the windshield left-top corner rubber in Picture Boxer-10 & Boxter-21 in the pic gallery ? Bad QC ??? it’s unbelievable sight for a launch showcar. Not very clear, but it could be a water drain. 450k for entry level Porsche is quite a good price. If the Boxster and Panamera GTS goes out together at the street, I’m sure many people will thought that Boxster is the more expensive and faster car because of it is a convertible and it has a traditional sports car styling. Reality is, Panamera GTS is twice as expensive than the Boxster and faster too. Sigh, common people will thought that Boxster is the better car. Too bad for the Panamera GTS owner. More and more super luxury cars launched in Boleh Land. I thought the economic here is not so good? Wow, the Boxster is so cheap, only the price of a 5-series. Between this and a 5-series, I’d go for the 5-series. It’s a car with split-personality.